You can’t leave a serious health problem such as varicose veins untreated. Varicose veins tend to appear due to stress, overweigh, pregnancy and sometimes they appear due to genetics. If you treat this condition in a superficial way it can lead to more serious problems like bleeding, ulcers in your legs and most of the times it can lead to surgery. This doesn’t sound too good, does it? If we caught your attention it’s time to present you a good treatment option which will help you get rid of varicose vein once and for all. 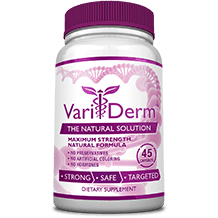 This formula is called Derma / e Clear Vein Creme. Check out some useful information about this product and then decide if you want to purchase it or if you want to keep looking for another option. As you have probably noticed this product is a cream. You have to apply twice per day a little bit of cream on the varicose veins and you have to rub it until it is absorbed by your skin. We couldn’t find anything about possible side effects of this product on their website but there is always a chance to be allergic to one of the compounds. That is why you have to consult your doctor before purchasing this product. 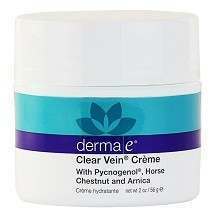 Derma/e Clear Vein Creme is sold in 2 oz containers at a relatively low price. A container costs $21.21. Derma/e Clear Vein Creme doesn’t come with a refund policy. The manufacturer doesn’t mention anything about the money back guarantee on its website. It seems that Derma/e Clear Vein Creme is an effective cream used by many people who are dealing with those painful varicose and spider veins. Users recommend this product and we think that it can be the right product for you too. It would be a huge plus however if this product was FDA inspected and the manufacturers offered an effective guarantee.